Some of the new 1TB Seagate drives come shipped with a 1.5GBps jumper enabled by default. The ST31000340AS drive has a jumper on the back that needs to be removed to enable 3.0GBps transfer. This "jumper secret" may also apply to Seagate drives so make sure to double check your existing and new Seagate drives for this limitation. 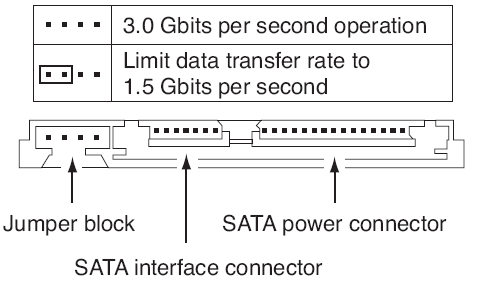 •Install a SATA host adapter that supports autonegotiation, leave the drive jumper block set to “Normal operation” (see Figure 3 below), and connect the drive to that adapter. This option has the benefit of not limiting the drive to a 1.5 Gbits/sec transfer rate. The only issue is that the jumper comes pre-installed on these drives in particular. Good luck and happy hard disking!